My first encounter with Sarah and her mixture of activism and craft was at an ‘I’m A Piece’ workshop in London in November 2012. I had never participated in any form of activism but was attracted to the event because I love hand embroidery, and having just moved back to the UK from living abroad I saw it as a great opportunity to meet new like-minded people. 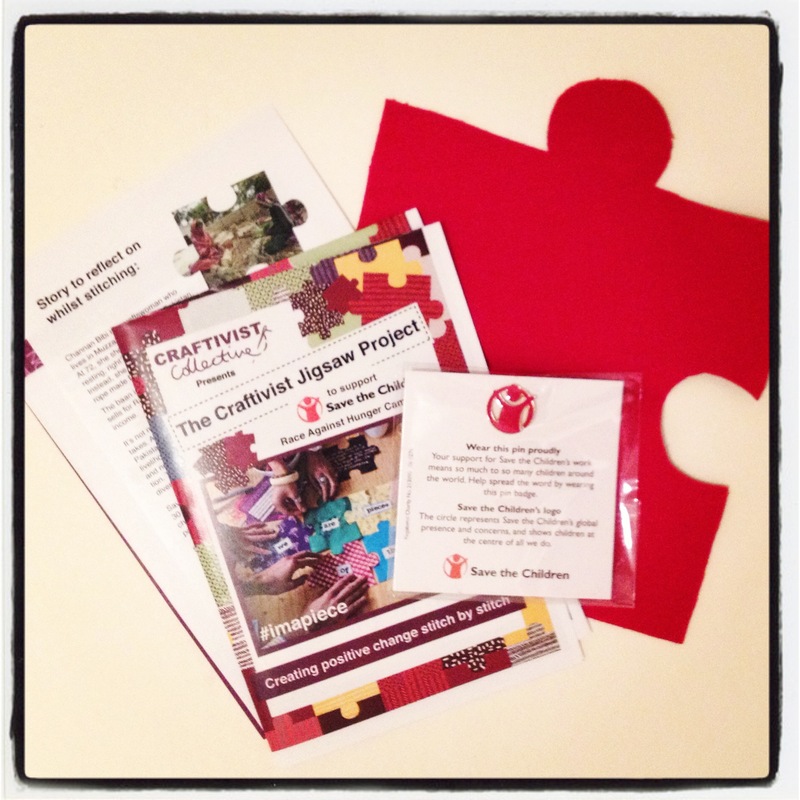 I had read about the premise of the event before I arrived so I had come prepared with my jigsaw piece and message ready to embroider. The brief said that you should embroider three jigsaw pieces, one for the group jigsaw that would support the Save The Children, Race Against Hunger Campaign; one for yourself to keep and one to send to your local MP. After much deliberation I decided to use the adopted philosophy of my online ethical retail business, Yours Sustainably as my message: “Happiness held is the seed, happiness shared is the flower.” I was close to completion of the jigsaw piece by the end of the event and Sarah gave us the deadline to send in the completed piece to be included in the installation that would be exhibited at the G8 summit to highlight the need to work towards the end of world hunger. I went home with every intention to finish my piece and complete the other two. The days passed and the deadline quickly approached. I managed to send my first piece to Sarah just in time to be included in the installation and then I put the other pieces in my fabric drawer and forgot about them, helped by the fact that I had struggled to think of anything ‘profound’ to embroider on them. My second Craftivist event was at the V&A in December 2013. I went with a friend from London College of Fashion and this time I was motivated by my Masters research into the use of craft for political and social communication. 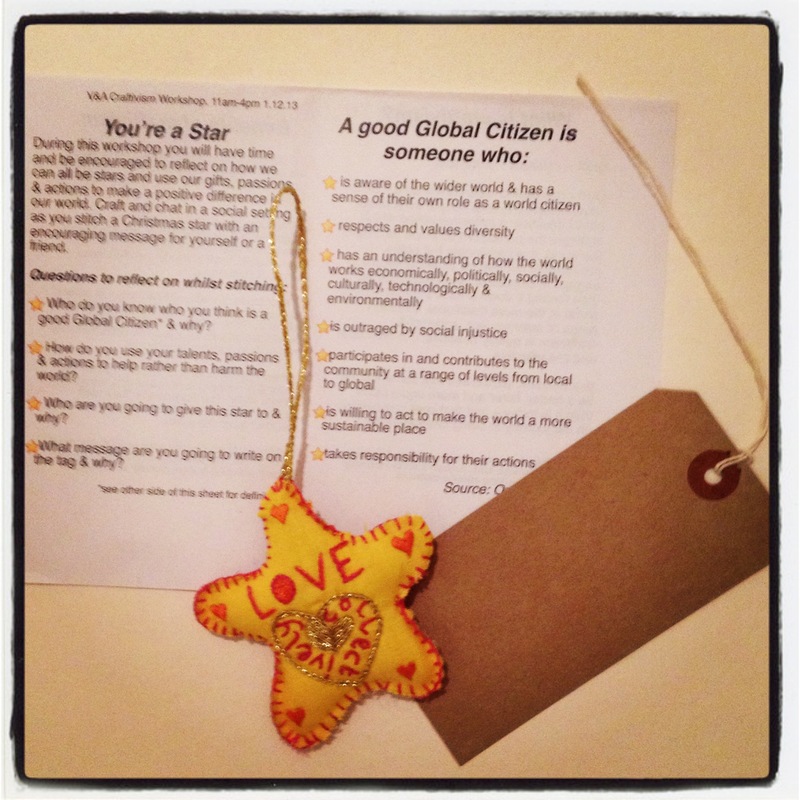 As a drop-in day time event there was less interaction with the other crafters and we collected our materials and started work on the project: a star to embroider with a message on how to be a good global citizen. Again I really struggled on deciding what to write and embroider on my star. For me the question of how to be a good global citizen provokes a need to think of some deep and meaningful statement. In the end I settled for ‘Love Collectively’ which was not really how I wanted to articulate what I had been discussing with my friend but we were both running out of ideas. Sarah suggested writing a message on a brown paper tag, attaching it to the star and giving it to someone who you wanted to pass your message on to. Again, I didn’t see the project through; on finishing my star I took it home and added it to my pile of MA research material but slightly missed the point of the exercise again. 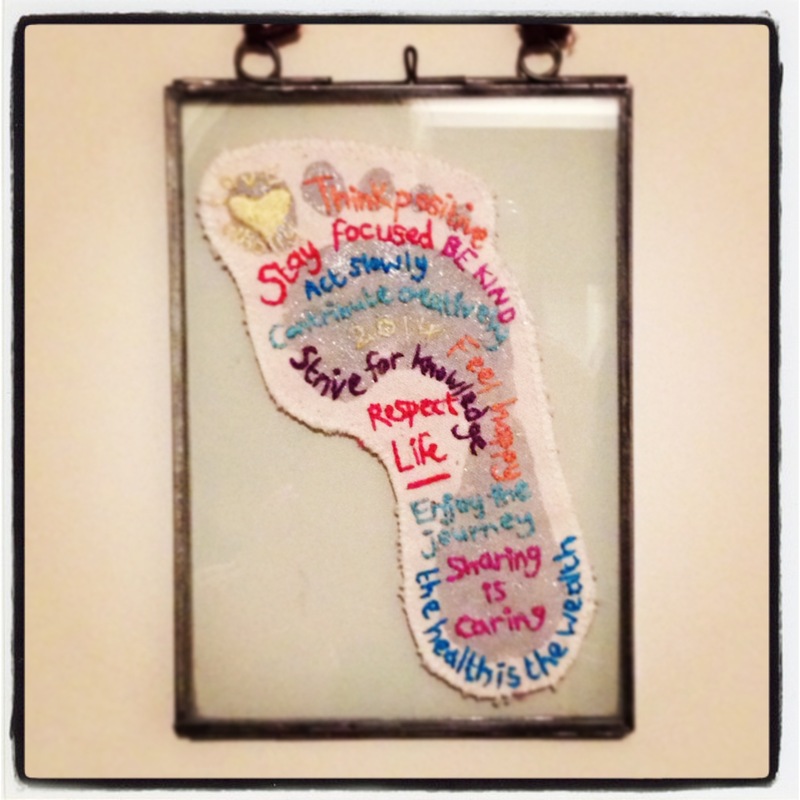 Jessica’s stunning completed Craftivist Footprint! I recently attended my third Craftivism workshop this January at Fabrications in Broadway Market, East London. This time Sarah spoke at length about how she started as a Craftivist, her personal journey and what she is trying to achieve with her growing community and workshops. Although I was familiar with her story I loved hearing if from her directly and when she spoke about many of the people being drawn to Craftivism as introverts this really resonated with me. I have never labelled myself as an introvert as such but when Sarah started to explain the project for this workshop something clicked. This time we were given a fabric footprint to embroider. Sarah suggested that we write ourselves positive messages to embroider and that when finished we keep the footprint somewhere prominent so that we will see it every day as a reminder to ourselves of how we want to live our lives. Whereas in the two previous workshops, which were projects that had outward facing messages, the inward facing nature of this project meant that I had no problem deciding what I wanted to embroider; given that it was January and the start of a new, busy and potentially very exciting year I had lots of positive messages I will need to be reminded of on a daily basis. The footprint project is the perfect starting place for any would-be Craftivist, for surely it is important that we have identified our own values and motivations for living in our world before we start looking to influence other people. 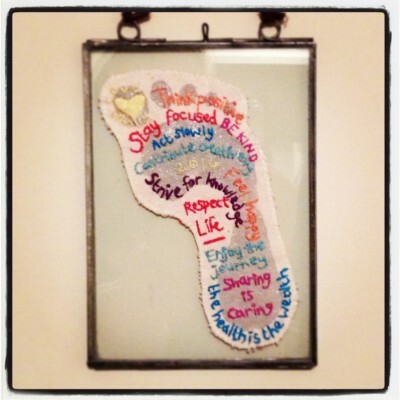 I am proud to have the footprint as my first fully completed Craftivist project, it looks beautiful in my recycled glass frame and will inspire me in my daily life and maybe to start my next Craftivist project…I think I might be ready for a mini-protest banner, watch this space!